It is important to always use the correct die clearance. Proper training and communication to operators and programmers create buy-in. Anyone working on a machine should understand the physics of the punching process. Improper die clearance—either too tight or too loose—is the number one reason that tools wear prematurely. If the die clearance is too tight, it is harder on the punch, causing it to wear quickly. Galling also occurs as the punch is rubbing against the hole. Tight die clearance also increases the tonnage on the machine, resulting in increased press maintenance and effort. If the die clearance is too loose, the die wears more quickly because material is rolled into the die before fracturing occurs. The result is excessive burrs, deposited debris and part deformation. These are all easily avoidable mistakes. Stacked tolerances in presses lead to alignment issues. There are numerous factors involved to punch a hole in the center of the die: shot pins, bores, guides, punches, lower die holders, and auto-index stations. These all provide opportunities for turret misalignment. Alignment tools come with the machine and are often delegated to the maintenance department. If your operator notices “saw toothing,” burrs on one side of the hole or wear on opposite sides of rectangles, this can be a clear indication that the machine alignment is off. In addition, excessive wear is being applied to the machine, leading to premature tool wear. Routine machine maintenance that includes realignment is encouraged and should result in higher production. The phrase “sharpen often and sharpen little” is a helpful one to follow. Many machines and tools with proper programming are seeing cycles in excess of 500,000 hits, but tools are perishable and will wear. Instead of pulling the tool at 550,000 hits and taking off .030, we recommend pulling the tooling at 500,000 hits and taking off .005. Your punches and dies are precision machined and must be sharpened correctly. The tools used in the machine have specific grinding requirements and must be maintained with the proper grinding wheels and especially a coolant: heat is a cause of tool wear. For more information on tooling maintenance check here. The importance of tool maintenance cannot be diminished and all operators should be made aware of what to maintain. Mate offers training and support to customers as a part of our mission. Contact your Mate sales engineer and ask if they will train you and your staff on the above topics. 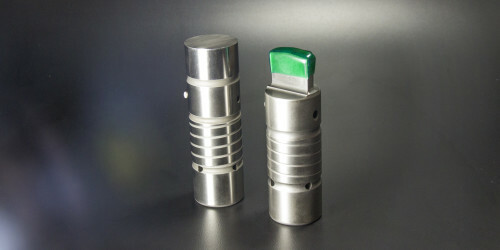 Your tooling costs will be reduced and production increased. Steve Pfleghaar is the Northern Regional Sales Manager.